The 2nd International GK Symposium "Regulators of Adaptive Immunity" will address recent advances in B and T cell biology as well as new findings regarding the development of autoimmune and leukemic diseases. The symposium will also provide a communication platform for highly motivated doctoral students and renowned experts in the field of immunology. This symposium is organized by the graduate students of the DFG Research Training Programs GK592 (Director: Hans-Martin Jäck) & GK1071 (Director: Bernhard Fleckenstein) & the Research Group FOR832 (Directors: Thomas Winkler & Hans-Martin Jäck). The Graduiertenkollegs (GK) and Forschergruppen (FOR) are supported in part by the Deutsche Forschungsgemeinschaft (DFG) and the State of Bavaria to provide doctoral students with a structured educational and research program. For more general information about Graduiertenkollegs and Forschergruppen please visit the DFG homepage. The DFG Research Training Program GK592 was founded in the year 2000 and is focused on the differentiation, activation and deviation of lymphocytes. Currently, 19 PhD students and 16 laboratories at 7 departments of the Friedrich-Alexander-University and the University Hospital are members of the GK592. Beside the improvement of interdisciplinary cooperation and networking in the field of lymphocyte research our program aims to enhance our doctoral training by promoting scientific education and social skills. All our students will be advised by a supervision committee throughout their doctoral thesis work. The presentation and scientific writing skills of our graduate members benefit from lectures and workshops as well as by regularly scheduled internal and external symposia, e.g. with our collaborating GK Immunomodulation from Würzburg. One of the highlights of our training program is the opportunity to extend the horizon of experience by a fully financed stay in a laboratory abroad or by an internship in a biomedical company. For further information please visit the GK592 homepage (in german). The DFG Research Training Program GK1071 was established in January 2005 its scope being the interplay of viral infection and the immune system. At present, 17 PhD students and 2 MD students integrated into 16 workgroups of the Medical Faculty at Friedrich-Alexander-University are in the final phase of their PhD thesis and 13 new students are recruited in 2008. In addition, 3 PhD students associated with the program perform their thesis work in Boston as part of a special cooperation with Harvard Medical School. Our research at the interface of virology and immunology encourages cooperation of the participating research groups working on viral immunodeficiency, basic startegies for prevention and therapy as well as oncogenicity of lymphotropic tumor viruses. Scientific training in the different fields is based on seminars given by external and internal speakers at the participating institutions. Additional training is provided by courses, e.g. presentation skills and scientific writing. Teamwork among the students in Erlangen is encouraged by a special GK seminar. Scientific exchange between Erlangen and Boston is a major focus of this program. Semi-annual retreats in Germany and in New England bring together the students and advisors from Erlangen and Boston for scientific presentations on the individual projects. These meetings also provide the opportunity for discussions with the mentors assigned to each of the students and for scientific and personal exchange at an international level. For further information please visit the GK1071 homepage. The DFG research group FOR832 was established in February 2007 to investigate the regulators of humoral immunity. Currently there are nine PhD students in eight laboratories investigating antibody repertoire formation, B cell maturation, signalling and antibody-mediated autoimmunity. For further information please visit the FOR832 homepage. Located in south-central Germany to the north of Nürnberg, Erlangen was first mentioned in 1002. Today, Erlangen is known by its university and university hospital. The University of Erlangen-Nürnberg was founded in 1743. Currently more than 25,000 students are enrolled in 11 different schools: medicine, law, basic sciences, engineering, philosophy, business and social and educational sciences. For further information about Erlangen please visit the official homepage. The 2nd International GK Symposium "Regulators of Adaptive Immunity" will be held at the lecture hall of the Department of Internal Medicine in Erlangen, Germany. 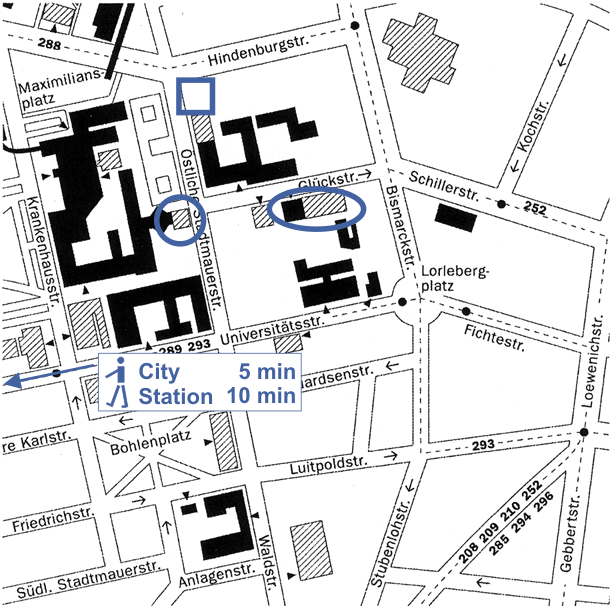 Additionally, you will find a detailed city map of Erlangen here. Several hotels are located close to the conference venue. You will find a selection of recommendable accommodations here. Registration is mandatory. The fee for the optional congress party will include a buffet dinner and all drinks. After receipt of payment we will confirm your registration by e-mail. Payments can only reimbursed if cancellation has been received 4 weeks before October 17. Please feel free to advertise our symposium amoung your colleagues. Please note: Both arrangements are for invited speakers as well as GK & FOR training program members only! On Saturday October 18th we will have a special poster session with the invited speakers, the PhD students from the DFG Research Training Programs GK592 (Lymphocytes: Differentiation, Activation & Deviation) and GK1071 (Viruses of the Immune System) as well as the DFG Research Group FOR832 (Regulators of Humoral Immunity). This is intended to be a selected event which gives our students the opportunity to discuss their projects and results with experienced scientists and to get feedback from experts in their field of research. The internal poster session is followed by the congress party for all participants. A congress party open to all attendees of the meeting will be held at the house of the student league Bubenreuth which is located very close to the conference venue. You will find a survey map under this link. Please note: to cover the costs we have to charge 25 €. This fee will include a buffet dinner and all drinks. You will find current information e.g., about important changes of the symposium program in the update section.